I decided to delay the posting of this article for a week because I wanted to share my experiences in the US where I visited 343, Microsoft, and Bungie – in case you missed it, you can read about here. But now it’s back to the schedule of weekly instalments of The Five Untold Stories of Halo 5, of which two – after this one – now remain. 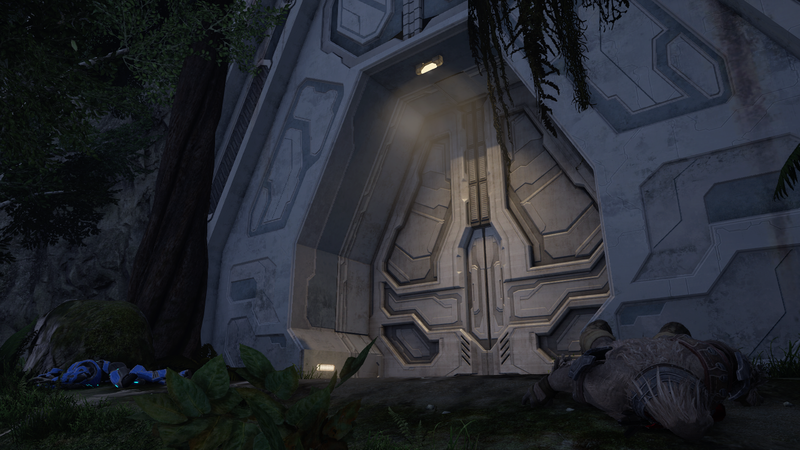 For this story, we return to a few familiar settings from Halo 2 and Halo 3, as well as Halo 5. As the death knell of the Covenant is at hand, Thel ‘Vadam learns of how he was ambushed by their forces at the Elder Council Chambers. The traitor is someone known to him, and, as we saw in Halo: the Cole Protocol, on the night of his ascension to kaidon, he must find a way to deal with such a personal wound in a way befitting of the person he aspires to be while the Prophet of Truth still whispers in his ear. Where the previous two stories, Meridian Approach and Axios, were scripts for scenes that were designed to fill in some gaps in the story of Halo 5 (Tanaka’s lack of a scene with Locke and Thomas Lasky’s reduced role), this one is a little different. This, and the stories to come, are prose pieces that expand on some of the existing ideas present in Halo 5 – whether they are certain story beats, character moments, intel logs, or a combination thereof. ‘Heretic, Hero’ specifically is based on one of the intel logs discovered in the weapons-down mission Before The Storm. Naturally, I felt there was a larger story to be told there: Who is Murok ‘Vadam? Why would he turn against Thel? As I approached the planning of this story to answer those questions, I found myself connecting certain dots back to moments in The Cole Protocol, Broken Circle, Halo 2 and Halo 3. Of the latter, there’s a line from Thel at the start of the game that has always stuck with me because it had huge implications for what kind of leader he might be following the end of the war. One last thing to note is that Mahlo ‘Turagg’s last three words imply that Thel executed Murok, which I take a bit of an issue with. That’s not the Thel ‘Vadam who faced Tartarus – leader of the Jiralhanae who slaughtered and ate his people, who tortured and branded him – and tried to redeem him because he understood that Tartarus was as much a puppet as he had been. 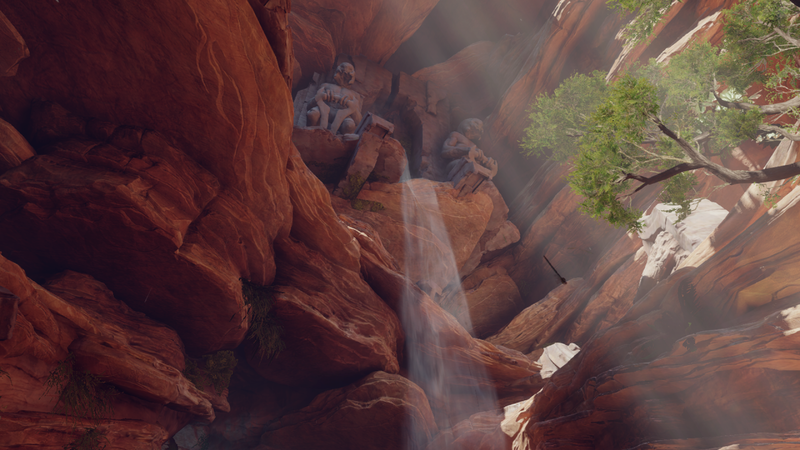 Halo 5 has a great many tragic stories for its Sangheili characters within its intel logs, to the point where the dawn of this new cultural renaissance for their species might seem more bleak than it should. There is, I think, always room for hope. And so, Murok’s ‘death’ may be a little more metaphorical than literal in my articulation of this story, with the added context of Mahlo not knowing the whole story and making certain assumptions. This ended up being the story I rewrote the most. Originally, I stuck to Mahlo’s log like it was gospel but it just didn’t jive well with the themes that Halo 5 looks to articulate, nor with the kind of person Thel has become. Anyway, I’ve rambled on long enough and should really just let the story speak for itself. “Tell me about the children,” the Prophetess asked. Meril ‘Vadamee looked up, cloaking her annoyance that she had been interrupted in the middle of her recitation of an old story of her people. The San’Shyuum nodded her snakelike head up to a hill a short distance away. Where vegetation may once have grown, the activity the young males visited upon it had ensured that it was scuffed clean and bore only uneven pits of dirt. A dozen Sangheili children pushed and shoved one another – grabbed, tackled, rolled down the slope, and then got up, ran back, and did it all over again. One young boy stood on the crest of the hull. He was shorter than all the other children, yet fought harder than any other. He blocked, pushed, kicked, and weaved his way around them like kel – light that dances on the waves. “I wish to get closer,” the Prophetess said. “Of course,” Meril slowly guided the San’Shyuum forward. She had foregone her throne and complained that anti-gravity belts were more trouble than they were worth, making the most of her strength as she approached the end of her first century, but the gravity of Sanghelios was stronger than she was used to and she was ebullient to have an excuse to get closer to the ‘Vadam clan’s matriarch. Meril gazed past the violence, to the setting suns in the distance that burned the skies of Sanghelios a brilliant orange before the wine-dark evening settled in at the end of this cycle. The Prophetess gestured the back of her hand towards the Sangheili at the top of the hill as he threw down another futile attempt to claim the top of the hill. Their words are poison. How many more generations of our children will live with a Prophet’s voice whispering in their head? Such bluntness towards a Hierarch would be received by many as a punishable offense, but the Prophetess had grown tired of the endless reverence bought by her great power. She found this Sangheili’s nature far more enjoyable. Internally, Meril sighed with relief. There was some comfort and peace in the old tales of her people, though she knew she was drawing close to the crux of a story that has lost its ending a long time ago. The door must’ve been about fourteen feet tall, which, on a different day, might’ve instilled awe in Murok ‘Vadamee’s mind as he contemplated the scale of his gods’ creations. But today, there was no awe, and there were no gods. The Sangheili had been ousted by the Prophets. Their kind, who had stood for millennia as the honour guard of the Covenant, were to be usurped by Jiralhanae savages – a radical change that had shaken their holy empire to its core. Murok felt a chill down his spine as the words of the Prophet of Truth were transmitted throughout High Charity and spread across the system. It was clear to Murok, as he stared at a holy mural on the wall – spattered with purple blood – that this was no mere period of difficult transition. Life was a struggle to claim the top of the hill. The Sangheili had enjoyed the complacency of that position for thousands of years, but had now been unexpectedly supplanted. The end of the world Murok had known had already begun. There was a last place he would ever go, a last sight he would ever see, a last thing he would ever say, and a last door he would ever walk through, in that world. And that door was in front of him now. The door began to part, sunlight spilling through the middle of its parting maw. Murok drew his energy sword, ready to face his end with a warrior’s spirit, and walked into the storm. But the storm never came. He stood atop a hill which curved around to a small grove, densely populated by rocks and thin white trees. A low, thin mist hung over the underwood and it felt to Murok has if he had stumbled into a dream. The ground was scuffed with footprints and bore uneven pits of dirt, some of which were filled with blood while others trailed off elsewhere… like bodies had been dragged away to hide the scene of an immense crime. At some point, however, they must’ve given up. 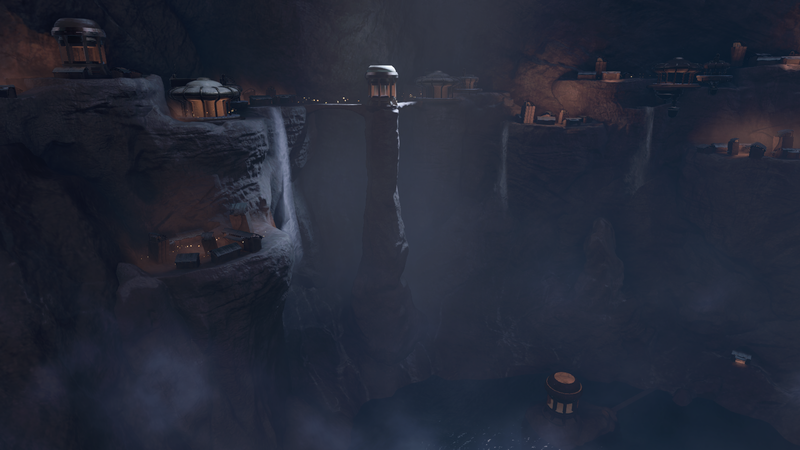 From where Murok stood, he could see dozens of corpses – Sangheili and Jiralhanae – left to rot in the dirt. Some of the Sangheili had holes blasted in their chests, no doubt from the explosive grenades of the nearby Brute Shots – ‘death lobbers,’ as the Jiralhanae called them. Others had chunks of flesh missing, arms and legs hanging on by a tendon, faces contorted – held, as if in eternal stasis – in unimaginable pain. These were his brothers. They had died afraid and alone, so very far away from their homes, with no gods watching over them. Even as they were in their kingdom. Murok wanted to speak the old burial prayer for all of these fallen warriors, to send them on the Great Journey, but no words escaped his mouth. A warrior at birth. A warrior in death. At that moment, he spotted the shimmer of active camouflage out of the corner of his eye. He turned and prepared to raise his blade, though his mind was still fixated on the scene before him. A silver-armoured warrior appeared, covered in ancient and ornate engravings, with strangely familiar amber eyes. Word had spread that he had been killed at the Library trying to retrieve the Sacred Icon, the key that would ignite the Halo ring and send the Covenant on their long-awaited Great Journey. It was Tartarus, Chieftain of the Brutes, who had delivered the Icon to the Prophet of Truth. The Arbiter was alive and as long as that was the case then they had a chance: a symbol for their people as they sought to vanquish their foes. The world Murok had known had ended. He had walked through the door. This grove was the last place he would go. The bodies of his fallen brothers, the last sight he would ever see. And the last thing he would ever say. He looks as if he might stand as tall as those mighty warrior sculptures that tower over the camp, Security Officer Mahlo ‘Turagg thought as he spotted Thel ‘Vadam, the Arbiter, who had just earned another great victory. A joint force of humans and Sangheili had taken down a Kraken, leaving the Covenant forces scattered as they attempted to regroup for their final stand at Sunaion. ‘Turagg sensed the end – the final end – coming to this long and bloody conflict that had divided their kind for so long. Having been one of the volunteers who came to Sanghelios from The Refuge, a partially-built Forerunner world hidden from the Covenant for millennia, he was all too familiar with how damaging strife such as this could be for his kind. It was five years since he had come here. Five years since he had stepped onto the homeworld of his people, atop the great mountains north of Zolam, and bathed in the welcoming light and warmth of Urs with his kin. From that moment, ‘Turagg knew that he would never again leave this place. This is where he would die, be it as an old man or with his blood spilled upon the rocks in defence of it. One final effort was all that remained to see a Sanghelios that was free of the Covenant. Free for the Sangheili to have a future of their own design. That was when the real work of their people would finally begin. The Arbiter had been in great peril recently – ambushed by the Covenant at the Elder Council Chambers; the kaidon who had greeted him was killed, as were twenty-five of the Swords of Sanghelios’ brothers and sisters. Somehow, the Covenant had tracked the Arbiter’s movements. After interrogating a very cooperative Unggoy, it emerged that the Arbiter had been betrayed. As Mahlo detailed his story, he paid close attention to his leader’s reaction as the words sank in. While the Arbiter maintained his calm and stoic edifice, Mahlo could see, beyond that, in his eyes, the word “betrayal” cut deeper than any blade ever could for Thel ‘Vadam. The Traitor did not resist capture, answered every question willingly, and was currently in chains. For he had revealed himself to be one of Thel’s own family. His name was Murok ‘Vadam. “This Heretic, and those who follow him, must be silenced,” spoke the Prophet of Truth with that eerie, charismatic gentleness. These were the words he had spoken to Thel when he had been stripped of his name, his rank, his armour, and his honour – all that had made him Supreme Commander of the Fleet of Particular Justice, six years ago. These were the words he had spoken to Thel when he assumed the responsibility of putting the disparate pieces of Sanghelios back together after the fracturing of the Covenant, and things went the way of blades. These were the words he spoke to Thel now, with that same gentleness, as he faced this traitor of his own blood – whom he had known as a child – and fought the instinct within him to take the easy path. It’s not who you have to be, he reminded himself. Thel had Murok brought to a rocky clearing, just out of the way of the camp. There was no need to make a spectacle of this, as he had done on the night he became kaidon of ‘Vadam. A member of his own family had betrayed him, despite voting in favour of his ascendancy, and sent assassins to murder him in his sleep. He had revoked the traitor’s name from the ‘Vadam Saga and banished his lineage from the keep, threatening to kill them as well. Urs had a strange way of having one live the echo of one’s life again – around another corner, from another angle. “You were not there,” Thel replied, standing at the edge of the clearing. Thel had been quite open about sharing direct feeds of his time on Earth, footage from human and Sangheili warriors that showed them fighting side-by-side. It was indelible proof that these former foes had a future together. They could not undo what they had done in the name of the Covenant during the war, but there was great honour in humanity. But that was something Thel had said. Not even to his own kind, but to the humans. Was that the paradigm in which he thought to understand them? Or had he still been so full of hate that he truly believed the only answer at the end of the war was even greater violence? Had it been the former, did he expect that their vengeance would not affect him? He, who was in so many ways the worst of them all, who had glassed so many of their worlds and killed over a billion of their people. Would it make any difference to tell them that I count the number of lives I have taken every night? The Prophet of Truth stirred again in Thel’s mind. His hand was on Thel’s shoulder, his lips by his ear. Darkened skies and lashing fire are all that remains for this vermin. And that was it. That was the future Thel had envisioned when he had spoken those words of punishment and retribution, with him as the leader of this new Covenant and ‘peace’ enforced on the people of the galaxy. 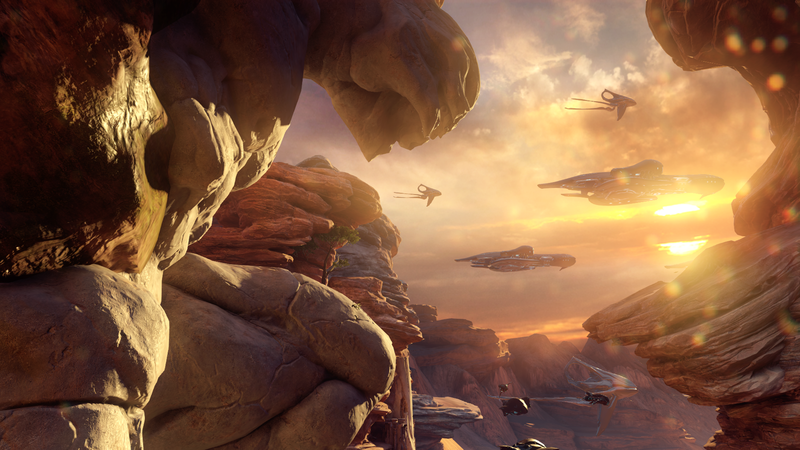 The Sangheili stood at the top of the hill, their foes laid low, and everybody else squabbled below them. He paused a moment to allow the question to sink in, wondering how Murok might have felt had he been in his place. Bounty, Alluvion, Mesa, Greydowns, Kroedis II, Estuary, Reach… these were the human names for the worlds had been set ablaze by his hand, slaughtering untold millions – all in the name of a lie. What thriving populations of people had lived on those worlds? How many unique cultures had he ended? Save the next one, Thel told himself, silencing the Prophet of Truth’s voice in his head. Be better. Save the next one. “What else is there?” Murok asked, turning his back. It was the same question a million others had asked. Those who had committed countless crimes in the name of the Covenant. Those who knew only its way of thinking – the way the Prophets had conditioned them to think. The way they, like gullible fools, had convinced themselves was right. For so many who faced such a devastatingly sudden loss of purpose and understanding, where it had been piously fed to them so easily for millennia, why not fall back on what was comfortable and familiar? The scale of their crimes was such that it could only drive one mad. Thel nodded, resigned, and reached for his blade. The Prophet’s Bane had a long history in the ‘Vadam lineage, drenched in their notions of glory and honour, going back to a time before the Covenant. Upon returning after the war, Thel had rebuilt it by incorporating the sword he’d used to kill the Prophet of Truth. Many saw it as a symbol of the new destiny the Sangheili pursued; Thel saw it as a reminder – one of an old story he had been told as a child. A reminder of a question the old god Urs had asked in order to decide which of the two brothers, who were in-dispute over the worthier path to take, to help. Two burnt orange prongs of superheated plasma extended from the hilt of the Prophet’s Bane. Thel thought back to the night he had been made kaidon of ‘Vadam, of the test he faced for being betrayed and the violence he had wrought to deal with it. He was that person no longer. “No,” Murok replied, his eyes shut tightly as he heard the low hum of the energy sword, braced for the end. Murok had never felt as baffled by the behaviour of another Sangheili as he did now, let alone one he had been set against as a child, who had once embodied all the traditional values of his people – or what the Covenant had made of them. Now, he sought to tear that all down. After countless years of fighting – a whole generation that had known nothing but war and hate and betrayal, and a society that had been so thoroughly defined by the Covenant – was it truly possible to build something new? But then, he supposed, Thel had known the darkness more than any other. Had he continued to rise even beyond the rank of Supreme Commander, he may have come to be revered – as Xytan had. Was it weakness that he forgave? That it seemed to come so easily? And if the Sangheili had a new beginning on the horizon, free of the Covenant, was there a place for someone like him in it? It was so much easier to have come to terms with the certainty of death from failure, to know how and when and why the end would come. To put your life into the hands of another – one who showed kindness that had not been earned – and to know that they would have you become something new. Murok did not know how to deal with that, but he supposed that one who had fallen and become an Arbiter would understand. A thousand new possibilities took shape in his mind, where before there was only one. Is this what it is to feel hope again? Thel ‘Vadam thought back on his family. He could picture them in his mind with perfect clarity, but not in the way the Sangheili had traditionally thought of it. Family, as Thel now understood it, was more than just blood. There was also a gruff human sergeant, a young commander, an old man in white, and a green-armoured Demon among them. It was at that moment that he heard the low hum of Shipmistress ‘Chava’s Phantom, arriving just in time for the coming battle’s final preparations. From within the craft, Fireteam Osiris emerged and stepped onto the sand. The skies of Sanghelios were dark now. Stars filled the wine-dark sky, and Qikost and Suban were aligned in such a way that they looked almost like a pair of eyes gazing down at the rebirth of this ancient, beautiful world from the heavens. Coming to a halt as the mountain path abruptly changed from rock to metal, the figure lowered its hood. As if the place were reacting to his presence, old machinery whirred to life. An archway assembled into place and swirling vortex of light appeared. The door lay before him. 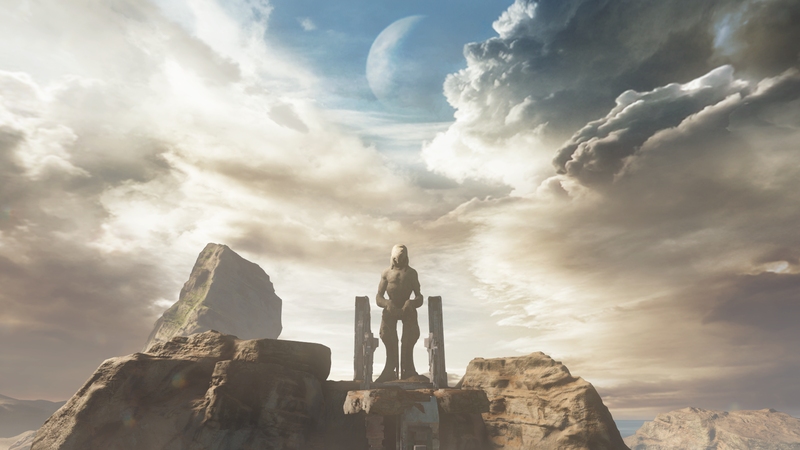 He took a last look around at the moonlit mountains of Sanghelios, breathing in the cool night air. This was the last he would see and feel of the place he had once called home. And stepped forward into his new world. Dude… Well done. I know I’ve left a comment on one of your works before, but I felt compelled to congratulate you on this awesome piece. There is little literature out there (fanfiction or otherwise) that deals with the fallout from Halo 3 from the Sangheili’s perspective. Why there aren’t more works detailing this – especially from a pivotal character like Thel’s point of view – baffles and frustrates me to no end. Actually, your story reminds me a lot of “The Return” by Rachel Beaudoin from “Halo: Evolutions.” Out of curiosity, was that a source of inspiration? Oh! REAL QUICK: I know I’ve already asked this – and you’re no doubt busy as all hell with all the projects you probably have in mind – but have you read “Halo: Bad Blood,” which picks up directly where Halo 5 leaves off from Buck’s POV? I only bring it up because your micro fiction’s setting and themes tie almost directly into an glanced-over scene from the this book where John and Thel get reacquainted for the first time in +4 years. And then say good-bye. Like, what did they talk about?! Cortana? Current events? Memories of Johnson and Miranda? WHAT? There’s a story in there that someone (most likely me) needs to flesh out! Good Lord, I never cease to embarrass myself by rambling, but damnit, your stuff brings these discussions out of me! I’m so grateful that you’re writing all of these introspective pieces, and hope you keep it up! Yeah, the lack of fiction that meaningfully explores the Sangheili perspective in the immediate aftermath of the war feels like a pretty huge vacuum. In this, I’ve always felt that the Kilo-5 books should’ve been an anthology series of short stories that focus on little vignettes from various characters’ perspectives that are thematically tied together – similar, I guess, to this project. The approach that Halo 3 took by sidelining Thel has always been greatly disappointing to me and it raises more questions than I think we’ll ever get answers to, which is what really formed the basis for this story. His promise of vengeance at the start of the game and killing Truth at the end are two pivotal moments that I wanted to explore, and you’re absolutely right in your comparison to The Return (one of my favourite stories in Evolutions – Kevin Grace’s writing and Rachel Beaudoin’s art captured my imagination like nothing else when I first experienced that story) because it grapples with some of that intense guilt and loss of purpose that has gripped the Sangheili. I wanted to connect that to the Swords of Sanghelios’ mission statement, as that’s another thing we haven’t really seen much of. We know that they’re ‘the good guys’, but what’s their goal beyond ending the Covenant? I really like the idea that the Sangheili grow into the role of caretakers – not as part of some grand plan by the Forerunners, not to claim the Mantle, but because they feel that it is their duty to use their strength to help others. They’ve come out the other end of the Covenant’s influence ready to do what they can to make amends for the damage they’ve wrought and build those bridges between species, and that comes down to Thel realising – after killing Truth – that revenge is an empty pursuit in which there can be no peace. He must forgive, not just his enemies but also himself, in order to move forward. But that’s enough of a treatise on my own stuff! I have indeed read Bad Blood and that moment between John and Thel was something I was really quite upset about. It speaks, I think, to the limitations of telling that story from one perspective: Buck’s perspective. The kind of story Bad Blood was going for really needed to spread out across characters rather than just narrowing its focus down to Buck, it needed a lot more breathing room than it got. You should definitely get to fleshing out that conversation yourself! PreviousI Visited 343 and Bungie!